I used to make this combination a lot. Then we cut back on fried foods, and we don’t do it as often. My husband and I made this last week, and I forgot how much I enjoy it. In a large frying pan (or wok–we used cast iron) over low heat add the vegetables. Mix several times until the cabbage begins to soften. Add the other ingredients and toss well. When the vegetables have become wilted, place the mixture in a strainer. Place the strainer in bowl and then in the refrigerator. Allow to sit for two (2) hours or until the mixture is cool to the touch. Follow directions on spring roll package for rolling using a dab of egg to seal. I put about a tablespoon (measuring spoon) into each wrapper. If I have leftover mix, I use it in the Fried Rice (below). It took me several times before I was able to make consistent rolls, so don’t be discouraged. To cook, preheat vegetable oil to 350 degrees. Place several rolls in at a time. Fry until golden brown. Allow to rest on paper towels while you finish the batch. Serve with your favorite sauces (we use honey). Prepare rice several hours in advance or the night before, so it can be chilled. NOTE: I’ve done it with warm rice, and it just doesn’t work as well. In a 10-inch skillet heat 1 tablespoon oil. Add beaten eggs (from Spring Rolls) and cook without stirring until set. Invert skillet over a baking sheet(wax or parchment paper works as well) to remove eggs (or just scoop them out); cut them into short, narrow strips. In the same skillet heat the remaining oil. Cook ham or pork, mushrooms (if used) and onion in hot oil for 4 minutes or till onions are tender. Stir in cooked rice and the egg strips; sprinkle randomly with 3 tablespoons soy sauce. Heat through, tossing gently to coat with soy. Serve with additional soy sauce, if desired. 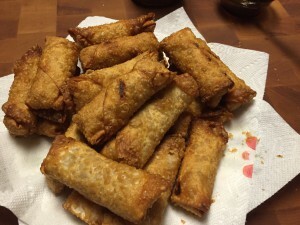 When we made the egg rolls this last time, my husband made Pad Thai (sorry, no recipe as he is constantly changing how he cooks it) instead of the fried rice, so no picture. I hope you enjoy this meal as much as I did. Yum!